Engineering students headed to the front of the class in January as they became teachers of engineering to more than 100 fifth grade students from Farragut Elementary School. 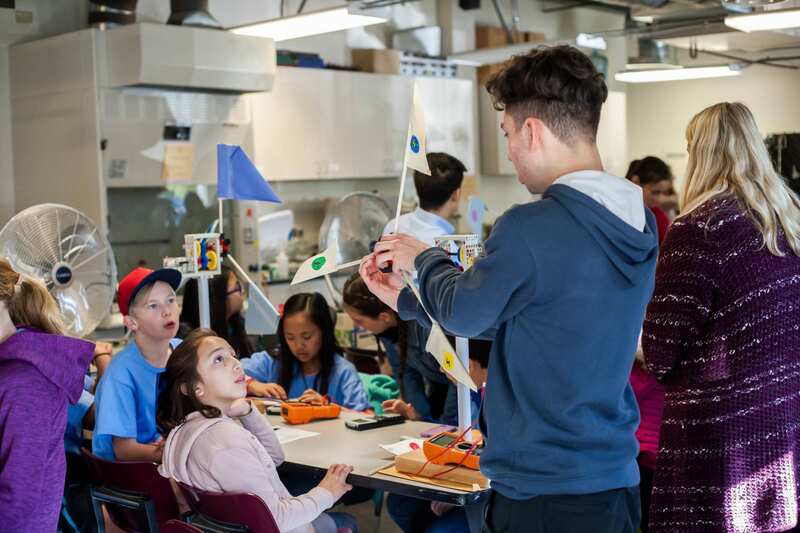 Students from the Frank R. Seaver College of Sciences and Engineering taught the fifth graders how to build and test wind turbines, and gave the elementary students a tour of the Loyola Marymount University campus. 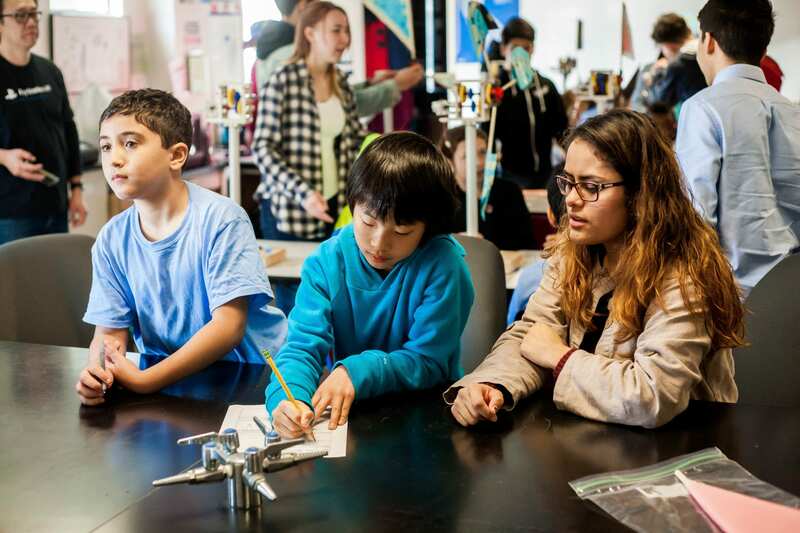 “Working with elementary students is a great way for our Seaver students to connect with the community that they will serve; to see they have a positive impact,” said Rachel Adams, professor of civil engineering and environmental science. Adams organized the project as a part of a grant she received from the college to develop water and energy-related service-based learning projects through a partnership with a local elementary school for the Introduction to Engineering course at LMU. Adams reached out to the elementary school in Culver City, and worked with their fifth grade teachers to plan the project. Freshman engineering students learned about wind energy and turbines during the fall semester, estimating power output and comparing it with measured output. When the opportunity with Farragut Elementary presented itself, 11 students volunteered to teach these concepts to the fifth graders. “It’s all about expanding and progressing the future, and elementary school is where it all begins,” said Raúl Ruiz, a freshman mechanical engineering major. Mechanical engineering students, Brandon Kim, a junior, and Danielle Leong, a senior, with Ike Bottita, a junior civil engineering major prepared and presented on wind energy to the fifth graders before their campus visit. 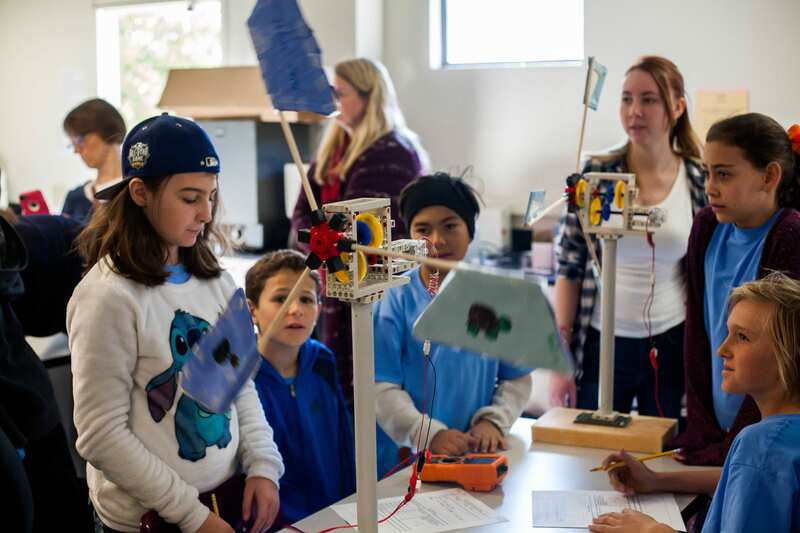 They helped the fifth graders design and build their own wind turbine blades made of wooden sticks and construction paper to later test in one of LMU’s engineering labs. Over two days, more than 100 fifth grade students spent several hours on campus. Seniors Vaughn Hartling, mechanical engineering major and Alejandra Garcia, environmental science major, led the elementary students on an hour-long campus tour. The fifth graders also worked on their wind turbines with engineering students, testing their designs and measuring the power output. “Engineers solve societal problems and it is rewarding for engineering students to see that first-hand by working with elementary students,” said Adams. The civil engineering students that volunteered were freshmen: Julius Lagmay, Emma McClellan, Leonora Meroth, Meredith Richter and Valeria Munoz, a senior. The mechanical engineering freshmen who participated were: Joshua Amurao, Juan Sebastian Bernal and Raúl Ruiz. The electrical engineering students who volunteered were freshmen: Kyle Munoz, Moriah Tolliver and Alejandra Vasquez. Seaver staff members Tom Boughey and Jacqi Smith, as well as Herbert Medina, associate dean, all helped to make this event possible.